There's something alluring about an historic, world-class resort that offers a plethora of social and recreational activities, where the emphasis is not on 27 holes of fairways, tees and greens. By and large, resort properties in New England do not trumpet their assets to compete with dozens of Sun Belt golf factories, but the Omni Mount Washington Resort, located in the White Mountains, will meet or beat some of the world's finest vacation destinations. 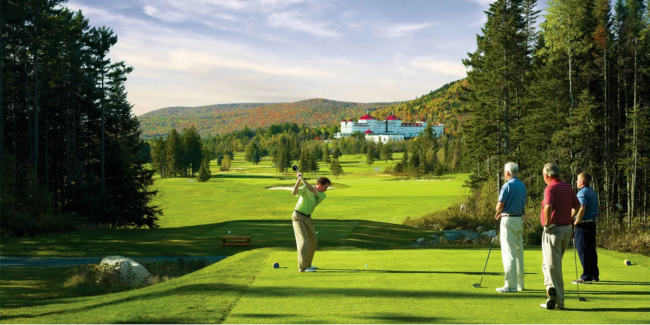 The magnificent 2000 acres of Mount Washington Resort offer award-winning 18-hole and 9-hole championship golf courses. Built in 1902 as the most luxurious hotel of its day by Joseph Stickney, who made his fortune in coal mining, the Mount Washington Hotel was listed in the National Register of Historic Places in 1975. Besides golf, the recreational opportunities seem endless: biking, horseback riding, fly-fishing, tennis, swimming, archery, ziplining, disc golf, rock climbing, spa and New Hampshire's largest ski area - Bretton Woods - is a favorite choice for skiers. "The Mount Washington Resort was purchased by Omni in December 2015 and is one of 11 resorts owned by the Omni family, from a collection of 50 worldwide," said Craig Clemmer, Director of Sales and Marketing. "We are very proud of the tradition of excellence of this resort, and the staff works hard every day with the goal of creating an experience for each guest that will last a lifetime. We have a reputation as a world-class resort and we deliver that message and service to our guest." The 18-hole Mount Washington course was designed by legendary Scottish architect Donald Ross and completed in 1915. Its backdrop features the Presidential mountain range including a close-up view of Mount Washington, the Northeast's highest peak at 6,288 feet above sea level. This par 72, 7004-yard layout has hosted four New Hampshire Opens and the 2010 New England Open. In August 2008, noted golf course architect Brian Silva restored the property to its original Ross design which included bunkers crafted in a classic flair and many bail-out areas in closely cropped swales surrounding the putting greens. "It may surprise some but golf is not the number one reason to visit Mount Washington Resort," said Vince Runyan, Director of Golf. "Both courses are in great shape and making a tee time is easy. Weekend rates in summer are $105 with cart and the hotel offers many golf packages to stay and play. Who would ever expect the golf courses to be in such excellent condition after a winter in New Hampshire that averages 177 inches of snow?" What is really surprising is that there's not a whole bunch of dramatic elevation changes considering its topography of mountains and forests. The par-5 11th hole and par-3 fifth hole feature stunning views of Omni Mount Washington Hotel and surrounding vistas. The Mount Washington course was voted Best Course You Can Play in New Hampshire by Golfweek magazine from 2009 - 2017. The 9-hole Mount Pleasant course first opened in 1895, and has been host to generations of golfing enthusiasts from New England and beyond. The par 35 stretches out to 3,215 yards and runs alongside of the scenic Ammonoosuc River. In 1989, the course was restored and upgraded by Cornish and Silva golf course architects. "Everyone loves to play this course," says starter Jay Dolan, a familiar face to New England golf fans that includes a career with the New England PGA of 1979 Player of Year and winner of one Mass Open, two Vermont Opens and three New Hampshire Opens. "My favorite hole is the No. 1 handicap hole, No. 6. It's a long par 4 and making par will require skill, not luck!" One of the more difficult tasks for a golf resort is to provide a challenge for both modest and accomplished players, and these two courses pass the test with multiple tee boxes. New Hampshire's golf season is a short and about 17,000 rounds are recorded annually. On season rates average about $100 (includes cart) and twilight rates (after 3) are about half-price. New Hampshire has 93 golf courses, from which 85 are open to the public. According to the National Golf Foundation, it is one of the least crowded states to play golf in. At Mount Washington Resort, management at Omni succeed in creating a guest experience that will last a lifetime. Reservations are required for dining at the Bretton Arms Restaurant, which is truly an amazing seven-course dining event. Expensive yes, but memorable, as most-four-star restaurants but when you visit dine at Bretton Arms. Prior ownership in 2007 sunk $50 million into restoration, refurbishment and revitalization of existing resort features. Omni paid about $92 million in December 2015 and on-season room rates start at about $250 night. Bed and breakfast packages fetch about $350 and unlimited golf and breakfast opportunities can be negotiated for about $500 night. The Omni Mount Washington Resort is an unforgettable vacation experience. The services, hospitality, food, staff and amenities are unique, fun and golf enthusiasts are in for a real treat. The web site for Omni Mount Washington Resort is OmniHotels.com/hotels/bretton-woods-mount-washington. Tom Gorman, a Boston-based golf writer since 1992, tends to be pessimistic and see things from the glass half-empty perspective.